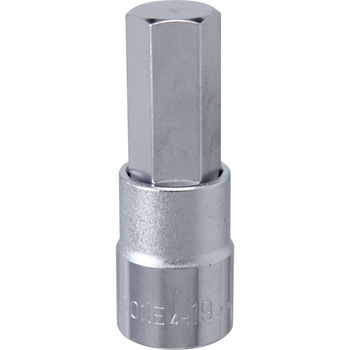 Hexagon socket of 12_14_17_19 mm is using this series. A good point is price, HEX's toughness is no problem. Is it called a socket part? I like it especially because it is thin-walled outside. Because it is thin, saying without breaking is used. Although I looked at the photo and purchased again, it is not a picture of the current model so please fix it quickly. I thought that I could get the same thing, but the design was changed. This review is about item#2178303. This review is about item#2178206. I bought it cheaper than others so it is saved. I tried to loosen the cross bicycle crank bolt with an L letter hexagon wrench and it did not bother me. So sweetly with this socket and spinner handle. In Hexagon wrench of 8 mm or more in bicycle maintenance, torque is insufficient, so I felt that socket is more useful. Hexagon wrench should be set up to 6 mm. This review is about item#02178251. Two side width which is often used in motorcycle maintenance: 6 plug-in: 12.7 manufacturer lineup was surprisingly few, I bought the same product. This review is about item#2178233. This review is about item#02178312. Since it is plating unlike cation, it will not rust soon so it is very good. Although it seems not to be hard plating, I think that it can not be helped in terms of price. Product price balance We are satisfied to purchase because it is long used as well as the manufacturer's credit. This review is about item#02178294. Because it is a big size, there are also many SHOPs not put on, it can be saved for purchasing on the internet. It is safe because it is not a Chinese tool but a tool of a domestic manufacturer. This review is about item#02178303. Since it is a manufacturer of trust, it was able to be used with confidence, there is no problem at the moment. This review is about item#02178233.